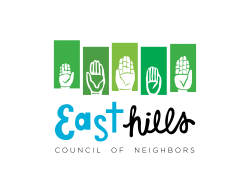 Mission: East Hills Council of Neighbors is a catalyst for neighborhood revitalization through effective, grassroots community organizing. For over twenty-five years the organization has worked on crime prevention, community building, and home ownership initiatives. While these activities continue, the need for a greater level of redevelopment is also being addressed. Extensive work on Wealthy Street, the corner of Lake and Diamond, and 920 Cherry have been the result of long term grassroots organizing. East Hills has always reached beyond the status quo to address the needs of the community as a whole, and to diligently create and maintain a diverse, safe and sustainable community in which everyone can live, work, shop and play. 02/20/2012 East Hills loves Congress- and so do I!